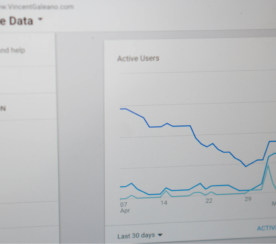 Google Analytics (GA) actually has a lot more useful features than you might think. So many companies use the few tabs and just put the rest on the back burner. URL Destination Goals is one of the features that isn’t a top priority for many companies, yet can be incredibly useful. If you’ve seen this option but never taken the time to figure out why it matters or how it works, now is the time to take on the challenge! The URL Destination Goals option is a great way to see if your online marketing efforts are actually giving you any results. There are many different types of Goals you can include, but URL Destination Goal is probably the easiest to use. This particular Goal will tell you whenever someone has visited a particular page on your site. This gathers data that you can later track and determine which of your marketing efforts are working and which ones are falling short. Step #1: Go to your GA and click on your target website. Click on the Admin button. Step #2: Click the “Create a Goal” button in the upper right hand corner. You can create up to 4 sets of Goals for each domain you have in your GA and then can add 5 Goals to each of these sets (making it 20 Goals). You can’t delete a Goal once it starts bringing in data, but it is possible to deactivate it. In short, choose your Goals carefully! 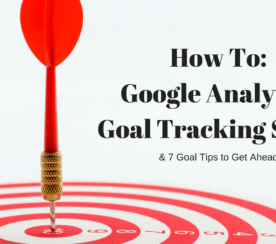 What you should track with Goals all depends upon your company. Where do you want people to convert, and what marketing aspects are in question? Are you loosing clients before they convert, but aren’t sure where? Here are some of the most popular areas to track. Most companies want to make sure their freebies are making a difference. Even more than this, companies want to know how many people from their free trials actually come back and convert. If you have a page that thanks someone for downloading a free EBook or a free trial, consider putting that URL as your goal and then comparing those numbers with the number of people that convert after a 30-day period. This is one of the most popular goals. As discussed above when setting up your goals, you have 2 choices: create a funnel to track your customers through each step, or simply add in a URL of the thank you page (or any page you use) that people see after they’ve made a purchase. If your business is all about grabbing those leads, you might want to track if someone fills out a form to get more information about your company. This is a popular goal for a service oriented businesses. In other words, your site doesn’t actually sell product or service, rather customers fill out a form to request a quote or something similar. Your company might also consider tracking how many people opt-in to your mailing list, fill out sign-up or registration forms, or first time commenters on your blog. You can learn more in this Kissmetrics article about how to get the most out of your confirmation and “thank you” pages. Check Your Conversion Data: Wait a few days before checking your data. Visit your Explorer tab in GA and then click on the Goal set you created. You will then see a nice table with all the numbers for your Goal (Goal conversion rate, visits, Goal value per visit, etc.). 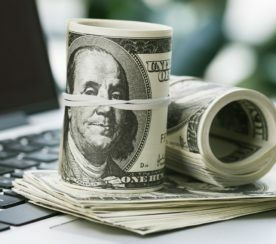 Track these numbers over a few months before you start making conclusions about what is the most valuable method in your marketing strategy and what can go. 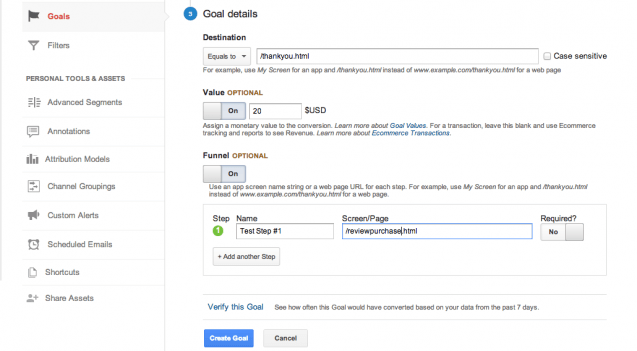 Have you ever set up a URL Destination Goal in the past? Did you find that it was helpful or gave you any kind of insight you couldn’t find anywhere else? Let us know your story and your thoughts in the comments below.